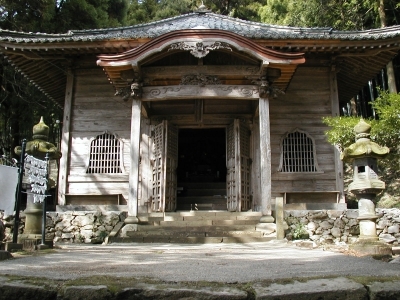 Kikkozan Fukujo-ji Temple is a branch temple of Hieizan Enryaku-ji Temple, the head temple of Tendai sect. This temple, located on a hillside at 753 meters above sea level, was built under the control of Emperor Saga in 810 to pray for huge harvest and universal peace. The main building was actually built from 1889 to 1955, but the traditional method of construction with wood was used, and holds two Buddha statues made in Heian and Kamakura periods. 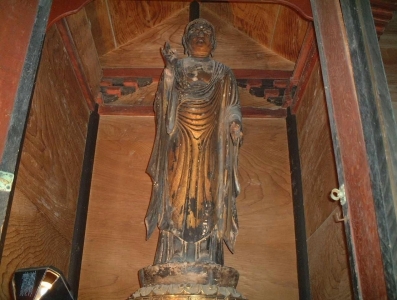 One of them is a wooden Kannon Bosatsu statue with eleven faces. It has a small statue of Buddha on the head, with the right hand in Yogan-in form, and a vase with lotus flowers on the left hand. The clothes has rippling drapery style called "Hompashiki" in Japanese. It is said to have been built in Heiran Period in the 9th century. The other one is Shaka Nyorai standing statue. It is a 1 meter-tall statue made of Japanese cypress tree, colored with gold flakes. The statue itself is very elegant, with the mild face, the right hand gently held up and the palm of the left hand turned upward. It is said to have been built by one of the sculptors in Kaikei school in the early Kamakura Period. 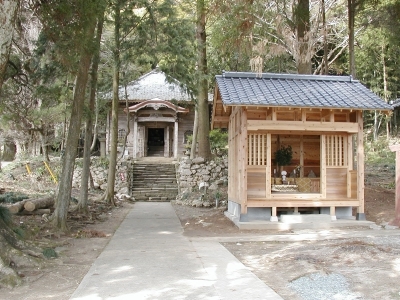 The Temple archive says that it was built by Eshin Sozu. The ginkgo tree and the Japanese yew tree on the precinct are designated as City's Natural Monuments. There is also another statue at this temple, which is a wooden Horsehead Kannon statue. It has a horse head on the top, and the face expresses anger. This horsehead statue is worshipped by stockbreeders as a deity for livestocks. On January 18, many stockbreeders visit here even before the sunrise.